SEGA has released Sonic Mania Plus at retail for Nintendo Switch today. Owners of Sonic Mania can download the Encore Mode DLC to upgrade to Sonic Mania Plus for USD4.99 via the eShop. Experience the ultimate celebration of past and future! Today, SEGA® announced that the iconic hedgehog is heading back to Sonic Mania for an Encore with Sonic Mania Plus™, the definitive version of the critically-acclaimed platformer Sonic Mania™. Now available worldwide, fans can purchase the all-new collectable physical edition on PlayStation®4, Microsoft Xbox® One, and Nintendo Switch™ at participating retailers for $29.99. Additionally, for the many fans who already purchased the original digital version of Sonic Mania on consoles and PC, an Encore DLC pack is now for sale via Steam and first party console stores for $4.99 to upgrade to Sonic Mania Plus. Developed by Hyperkinetic Studios in collaboration with Sonic Team, Sonic Mania Plus builds off the momentum of the critically-acclaimed platformer, Sonic Mania. Jump back into one of the best platform games of 2017, with two new playable characters from past Sonic games, Mighty the Armadillo and Ray the Flying Squirrel, and a new Encore mode that provides a fresh look to familiar zones with new challenges and layouts for new and veteran players alike. Competition and Time Attack modes will also receive an update allowing four player competitions, and ghost challenges for time trials. 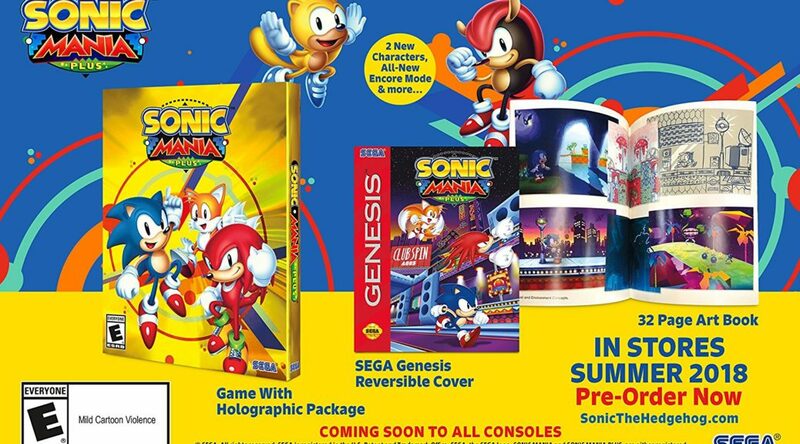 Sonic Mania Plus comes with more than just an awesome gaming experience: the all-new physical edition is encased in holographic packaging, which includes a reversible SEGA Genesis cover and a 32-page artbook.